Are you living the trophy life? Read the post,play the mix, and answer your question. 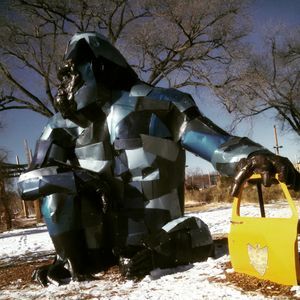 I was walking on Guadalupe, passing Paseo De Peralta, and saw the gorilla with the taxi cab door in his hand. That is a great example of living the trophy life, I thought; grabbing your gold, big time, and striking a pose. This mix contains Juke/footwork and a bit of drum and bass. I picked up most of the tracks on one website, a record distributor in the UK. A few tracks I found on SoundCloud. Deep website digging plus quick programming and we have 30 minutes of, what I would consider, current styles and storytelling mixing. When I speak of Storytelling in mixing, I am referring to when a DJ selects tracks with lyrics or vocals that can reflect a theme throughout the mix. This mix, for instance speaks of working hard and feeling boastful about oneself. And we can look at that as something beneficial. Sometimes we need a little boost and we are the only ones to provide that for ourselves. This is a battle song, like when the break dancers would line up and show their best moves. This is a lineup of tracks that I chose for their potency. Are you living the trophy life? Are you grabbing what you consider gold and making something of it that you enjoy? Are you displaying it for others to enjoy as well? I encourage you to listen and share with friends. Previous Post Juliet. Seize Her!